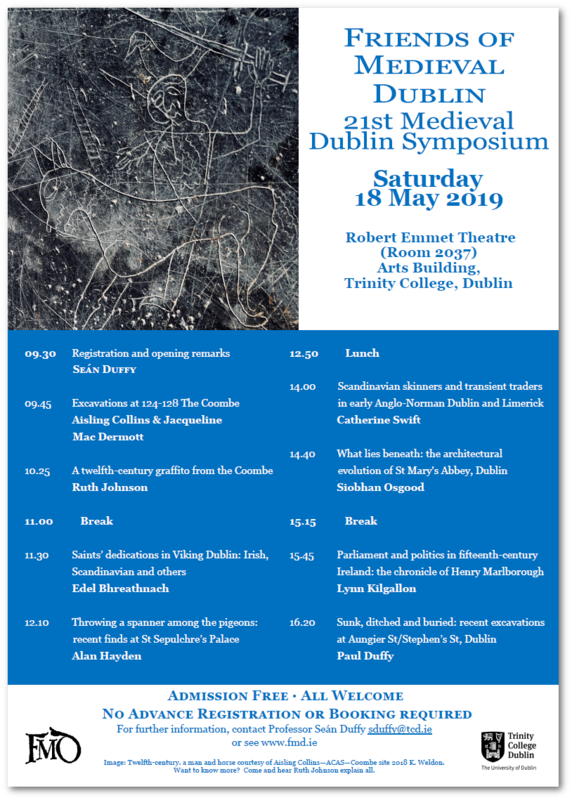 This year’s Friends of Medieval Dublin Symposium will take place in the Robert Emmet Theatre (Room 2037) in the Arts Building, Trinity College Dublin, and will provided a wealth of new information on this fascinating medieval city. Of course, we can’t tell you exactly what will be revealed at the symposium – for that you must come and hear for yourself – but here is a sneak-peak to whet your appetite. 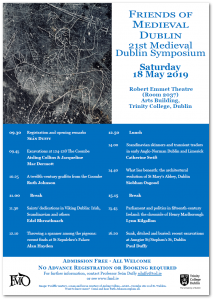 The Coombe will be the focus of two papers when Aisling Collins & Jacqueline Mac Dermott discuss the excavations at 124-128 The Coombe and Ruth Johnson focuses on a twelfth-century graffito from the area. Edel Bhreathnach will consider Irish, Scandinavian and other saints’ dedications in Viking Dublin and Alan Hayden will examine some recent finds at St Sepulchre’s Palace. You’ll learn about traders in Catherine Swift’s paper about Scandinavian skinners and transient traders in early Anglo-Norman Dublin and Limerick and Siobhan Osgood will unearth the secrets beneath the architectural evolution of St Mary’s Abbey, Dublin. Lynn Kilgallon will delve into the chronicle of Henry Marlborough for information on parliament and politics in fifteenth-century Ireland and Paul Duffy will reveal all about recent excavations at Aungier Street/Stephen’s Street in Dublin.